We present our Arrows Over Dollar Money PowerPoint Templates And PowerPoint Themes 1112.Use our Success PowerPoint Templates because, You have some hits, you had some misses. Use our Money PowerPoint Templates because, Expound on how you plan to gain their confidence and assure them of continued and consistent excellence in quality of service. Use our Business PowerPoint Templates because, Enlighten them with your brilliant understanding of mental health. Use our Arrows PowerPoint Templates because, Explain the various related aspects of these varied tracks and how they will, on hitting their own targets, cumulatively contribute to hitting GOLD. 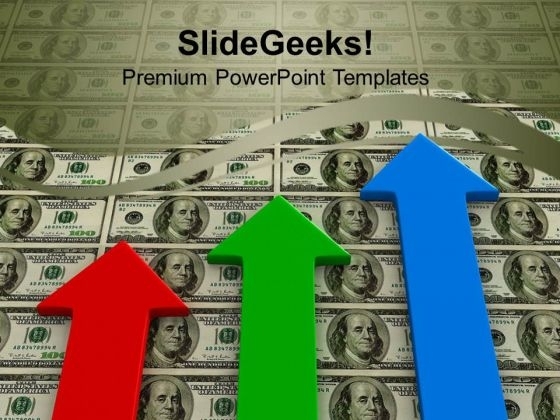 Use our Finance PowerPoint Templates because,Designed to attract the attention of your audience.Use these PowerPoint slides for presentations relating to "Arrows and dollar money, business, success, arrows, finance, money". The prominent colors used in the PowerPoint template are Red, Green, Blue Our Arrows Over Dollar Money PowerPoint Templates And PowerPoint Themes 1112 encourage an ethical approach. Exhort your team to stay above board. Get fab and cool with our Arrows Over Dollar Money PowerPoint Templates And PowerPoint Themes 1112. Be the trendsetter with your thoughts.